For the tenth time in a row, the latest customer satisfaction rankings from J.D. 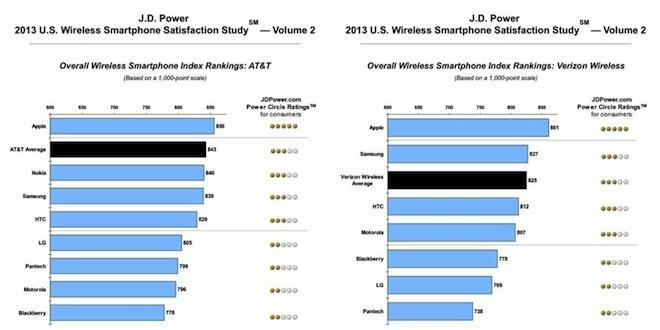 Power and Associates show that Apple is again the top company for smartphones across major U.S. carriers. The latest study breaks down rankings by carrier for the first time, detailing customers' satisfaction with both phone makers and their carrier. The firm notes that the study, conducted across over 16,000 owners of smartphones less than a year old, measures customer satisfaction "in four factors: performance (33%); physical design (23%); features (22%); and ease of operation (22%)." 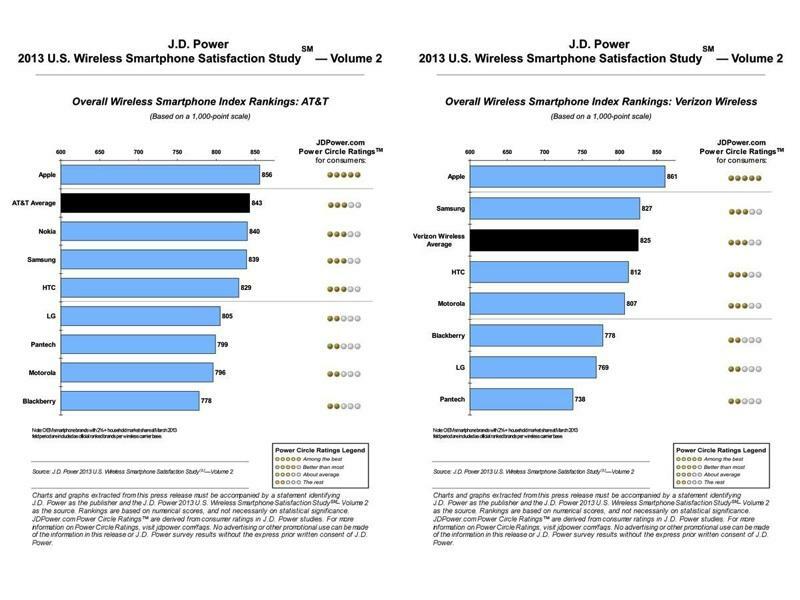 The study found that among major American carriers, AT&T ranked first in average satisfaction scores, followed by Sprint, T-Mobile and Verizon last among the top four. However, Apple's highest score by carrier was on Verizon. On both AT&T and Verizon, Apple ranked higher than the carriers' average score, and was the only phone maker to be ranked "among the best" on either major carrier. On AT&T, Nokia and Samsung were nearly tied for second place, but both phone makers delivered models that were below the AT&T average. Other phone makers, including LG, Pantech, Motorola and Blackberry ranked well below average, earning a "the rest" ranking by the study. On Verizon, Apple scored substantially above second place Samsung, which was ranked "about average" but ahead of HTC and Motorola. Blackberry, LG and Pantech earned significantly lower scores. Nokia and Samsung were nearly tied for second place, but both phone makers delivered models that were below the AT&T average. Other phone makers, including LG, Pantech, Motorola and Blackberry ranked well below average, earning a "the rest" ranking by the study. 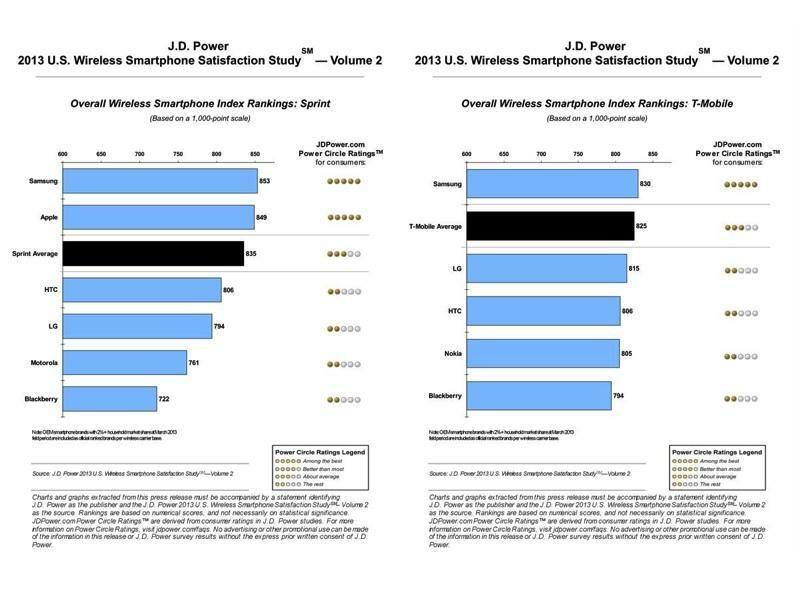 On Sprint, Apple ranked slightly lower than Samsung, but both were ranked in the top "among the best" circle, with HTC, LG, Motorola and Blackberry all earning scores well below Sprint's average. Apple didn't figure into the T-Mobile rankings because the study began in February, before the company had launched iPhones with that carrier. Samsung scored slightly above average, but there was less divergence among the remaining scores. Since the study began, Apple has also launched its new iPhone 5c and iPhone 5s, which add new LTE wireless support for foreign carriers primarily in Europe and Asia. However, both models also add new carrier support for bands used by Sprint, something that may help enhance users' experience on that carrier.